After watching The Virgin Suicides I wanted more books by Jeffrey Eugenides and more films by Sofia Coppola. I now have a copy of Eugenides’ The Marriage Plot, but that’s on a ridiculously big to-read pile, so more on that later. 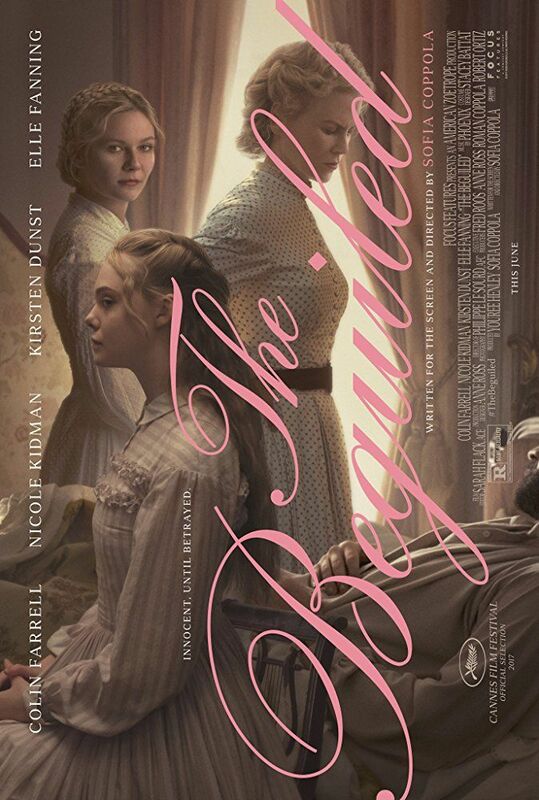 Quicker gratification was had through renting Sofia Coppola’s The Beguiled, a Southern gothic set in rural Mississippi during the American Civil War. Released last year, it has a high-powered cast; Nicole Kidman and Kirsten Dunst play two hot but buttoned-up schoolmarms looking after a few stranded students (including Elle Fanning, Australia’s Angourie Rice, from Jasper Jones) all walled up in their seminary on the edge of a forest waiting out the war. One of the younger girls comes across a wounded enemy soldier in the forest and her teachers decide not to turn him in and to tend his wounds and let him recover his health within their four walls instead. But nobody reckons on the hotbed of lust that can become of a bunch of beautiful women of varying age locked up with a charmingly helpless (but growing stronger every day) Colin Farrell. In short you don’t know who needs protecting more, him or them, and that scenario keeps changing over the course of the movie. It has the Coppola cinematography I craved. The outdoor shots, particularly, of the massive trees dripping with Spanish moss, dwarfing the human story playing out beneath them, somehow frame the whole story, emphasising their isolation and heightening the sense of dreamy beauty. And the intimate shots of the women and their faces make for another sensitive portrayal of human beauty, emotion and desire. The narrative has plenty of suspense, fuelled by a sense of imminent danger and disaster, and controlled, nuanced performances from the actors. The ending, when it comes, is melancholic and subdued. I didn’t mind that too much, but Charlie, who I watched it with, was disappointed, having hoped for something a bit more dramatic. The Ministry probably would have hated the ending. Interestingly, like The Virgin Suicides, this was a female director making a movie from a book about female power and sexuality, that was originally written by a male author. I wonder in circumstances like these about the multiple acts of creative perception and imagination that led to what I finally see onscreen, especially since it’s finally coloured by me, the person watching it. It’s not haunting like The Virgin Suicides, and probably isn’t something you’d watch twice. But I would be interested to see the 1971 version (starring Clint Eastwood) and definitely recommend watching this, to anyone interested in contemporary cinema. You won’t be bored, unless you’re exclusively into Marvel movies. Speaking of which, I’ve just seen this trailer for Venom. I don’t generally think much of Marvel movies (X-Men and other exceptions aside) but the blurb from its PR people called it “one of Marvel’s most complex characters”, and the preview looked cool (until 1.20 when I stopped watching, as I do in all trailers now). Now I’m dithering over whether to go see it. Anyone excited about this?